Some days I have a LOT of laundry for my family of 7. When the pile seems overwhelming, I've employed a simple trick to get through it a little easier. The worst part of doing laundry, for me, is getting it all folded. So, I make sure to stagger a hard to fold load (like clothes) with an easy to fold load ( like towels or diapers). Knowing that after folding a large load of clothes my next load will have very little folding helps me to keep at it and not procrastinate. There are days when I only have clothes and this doesn't work, but most days I have at least a load of diapers or towels or sheets. Something so simple helps keep the laundry done and Works For Me!! 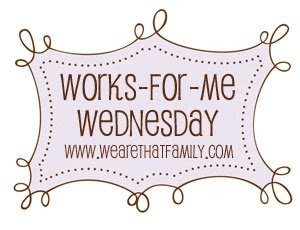 Visit We Are That Family to share what works for you and read tips from others! Great tip! We have a family of 5 and the laundry is always hard to keep up with. My 15 & 12 yr old are in charge of folding & putting away their own clothes.